LOS ANGELES - Yvonne De Carlo, the beautiful star who played Moses’ wife in “The Ten Commandments” but achieved her greatest popularity on TV’s “The Munsters,” has died. She was 84. 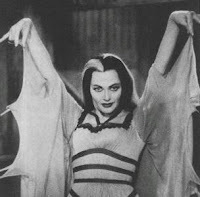 But for TV viewers, she will always be known as Lily Munster in the 1964-1966 slapstick horror-movie spoof “The Munsters.” The series (the name allegedly derived from “fun-monsters”) offered a gallery of Universal Pictures grotesques, including Dracula and Frankenstein’s monster, in a cobwebbed gothic setting. 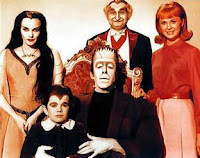 While it lasted only two years, the series had a long life in syndication and resulted in two feature movies, “Munster Go Home!” (1966) and “The Munsters’ Revenge.” (1981, for TV). Yvonne DeCarlo was born Peggy Yvonne Middleton in Vancouver, British Columbia on September 1, 1922. Her father abandoned the family in 1925; afterward, DeCarlo's mother worked as a waitress to support the family. Nonetheless, she took great interest in her daughter's budding talents as a dancer. In the late 1930's, DeCarlo and her mother made their way to Hollywood. Soon, DeCarlo found work as a chorus girl, and began making the rounds at casting calls, trying to get into the movies. By the time she celebrated her 19th birthday, she had begun landing small film roles, first at Columbia Studios and then Paramount. She appeared in about 20 films between 1941 and 1944, but only in small roles and bit parts. 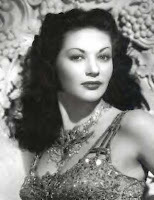 DeCarlo had to wait four years for her breakthrough role in the 1945 Universal Studios Technicolor film Salome, Where She Danced. Finally, at Universal, she found success and meaty film roles. Her next big role was in 1947's Song of Scheherazade. DeCarlo's career picked up when Maria Montez left Hollywood behind, but unfortunately, DeCarlo found herself typecast in costume epics and musicals that were quickly losing favor among movie-going audiences. Her starring role in the 1948 western Black Bart helped DeCarlo bridge the gap between costume dramas and the western genre, although she portrays an exotic European beauty, much as she had in earlier roles. DeCarlo's success in Black Bart helped change her image, so much so that she soon became typecast in westerns. Throughout the 1950s, she made scores of westerns, including Tomahawk (1951), Silver City (1951), and Shotgun (1955). And she even appeared in the pilot episode of the TV series Bonanza in 1959. Probably her best remembered role in the 1950s was in The Ten Commandments (1956) as Sephora. In addition to her acting career, DeCarlo released several albums in the 1950s, highlighting her pleasant singing voice which she had previously showcased in her 1940s musicals. DeCarlo married actor and stuntman Robert Morgan in 1955. Morgan appeared with DeCarlo in Death of a Scoundrel (1956), and he also acted in at least one episode of The Munsters. With the birth of her two sons in the late 1950s, she cooled her acting career, taking on only a few guest roles on television shows such as Bonanza. 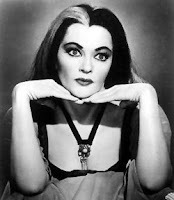 By 1963, she was once again active in Hollywood, making a couple of films before being cast as 'Lily Munster' in the CBS-TV series The Munsters. I've always been partial to The Munsters and have shared my love of their show with my kids. Yvonne, you will be missed.